Great for asset management and sharing content. Not ideal for Word docs and Excel format assets. It's well suited to be your overall repository of content... especially diverse content. It's less useful for content-in-development as the version control is not what it could be for documents that are being collaborated on by multiple people. But once the thing is done, and you have a final version (at least for now) then Bynder's your best choice. Provides instant access from anywhere with a web connection to content. Enables development and use of large image repository that is well organized, promoting easy reuse and accessibility. Accommodates near-real-time edits/changes; changes are reflected almost instantly, as soon as refreshed. Adobe does a decent job of adding features and support, such as for new file formats (added PNG support, when previously only supported GIF and JPG). User interface reminiscent of Microsoft Word, enabling fast customization. Great way to add Cloud capabilities and content management to your workflow. Easy to learn and use; learning curve minor. User-friendly interface, clean and easy to navigate - this has helped with adoption and training so that staff feel empowered to use the portal. Completely customizable filters - particularly helpful for locating specific photos quickly. Storage - safe and secure web based storage, frees up tons of space on our org Google drive and server. 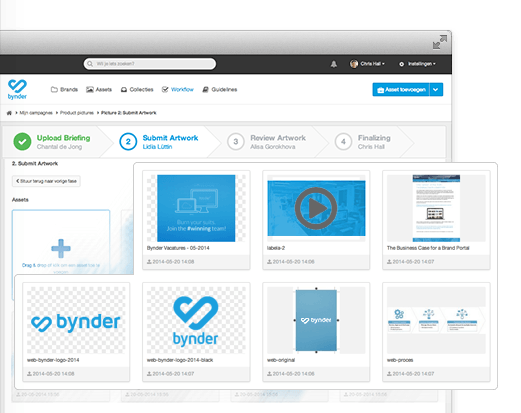 Bynder regularly adds or upgrades their system's functionality. The analytics tool is relatively new for them, so I imagine they'll be adding many more elements to that dashboard. I'll continue to use this product for many years. Adobe is making it clear they are taking customer feedback seriously and there continues to be growing demand for Adobe CQ implementations. As a developer, I find that there is still lots of room in this platform to try new techniques and really keep our implementations up to par with the latest standards. This is one of the best java based Web CMS solutions and Adobe has done extremely well to connect all possible integrations required for digital marketing. The rest of the other vendors are still struggling for a complete solution. Bynder's interface won us over - it's clean, simple, and so easy to use. We knew our colleagues wouldn't adopt a program that felt clunky or old, so when we saw Bynder's portal, we knew it was the right choice. Improvement in customer service, as the companies are able to update their product/service offerings as soon as any updates are made. Increased marketing presence and quicker response to changing market trends. Avoiding legal and regulatory obstacles by creating a more consistent content across the organization. More polished and compelling national marketing pieces due to greater and better use of photos. More polished and compelling regional marketing pieces due to regional staff members ability to access assets directly and select from full bank. Greater efficiency when designing pieces (easy to share assets with external designers). Increased use of marketing assets across regions due to sharability.